A little over a month ago, a fellow from the UK contacted me about adding a few features to ADPassMon. We sent a some emails back and forth and he decided to fork my ADPassMon github repo and take a stab at modifying my code himself. He has just released his project as ADPassMon v2. I gave him a few pointers along the way, but all new features that differentiate it from my project are entirely his own work. I’m frankly impressed with how quickly he was able to wrap his head around AppleScript ObjC and achieve his feature goals. If you are a current ADPassMon user, I encourage you to take a look at his detailed write-up and see if his fork will fit your environment better. It’s bug-squashing season, apparently. This release is brought to you by Joe Pfeifer, who reported a bug with ADPassMon’s handling of the pwPolicy setting. This bug was interfering with ADPassMon’s ability to bring up the Change Password dialog. This should now work correctly, whether or not you have configured the pwPolicy setting. 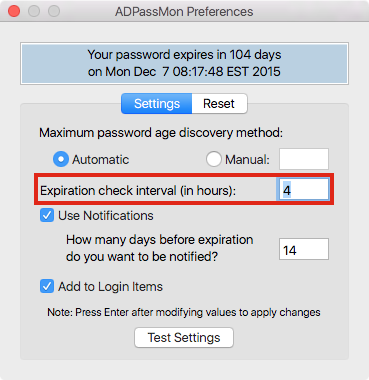 Version 1.9.2 fixes a bug that caused ADPassMon to not appear correctly in Activity Monitor. Thanks to commenter Mike Carver for letting me know about the issue. That last bullet point is the most convenient way, particularly because I’m about to tell you how to do it. We’ll use Automator to create a Service that uses AppleScript to get the home directory location of a username via a dscl query, and show the path in a dialog box in both Mac and Windows-friendly formats. As a bonus, we’ll let either of the paths be copied to the clipboard for easy pasting. It would be really useful for helpdesk if you could link to various OS X system elements, hyperlink style. Like System Preferences, etc. That got me thinking. I know that apps can register themselves as handlers for certain url types. Panic’s Transmit, for example, can handle ftp urls: if you type “ftp://some.server.com/” into Safari, Panic will launch and try to connect to that URL. Since the pros can do it, I figured it would be possible to create a new url protocol name so that if I typed “syspref://Network” into Safari, a simple app could parse that URL and tell System Preferences to open directly to the Network pane.